This short concrete video is a quick introduction to the many possibilities available using concrete. Take a quick tour of examples of concrete countertops we've done for residential, commercial, and designer projects. 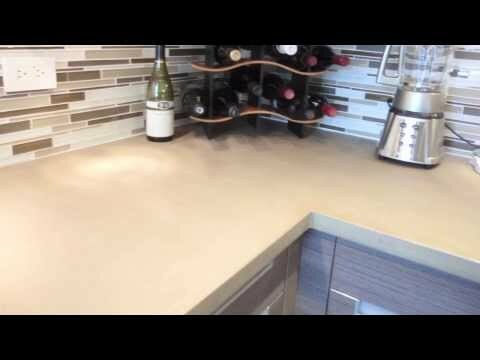 The quick slideshow also demonstrates the detail options that are possible and innate to the construction of concrete countertops. As our concrete tops are poured into custom molds that are constructed in our shop, we can fabricate any size or shape. We regularly make runs up to or exceeding ten feet in length, and of various thicknesses. Our concrete is mixed and poured right in our shop, which allows you to choose from a wide variety of standard colors or pick a custom color for us to match. Since the color is mixed throughout the entire countertop, you don't have to worry about the countertop chipping and removing the color. Concrete countertops are incredibly durable, and can withstand heavy daily use without sustaining damage, but it may chip if struck with a blunt object. The finish is also stain, heat, and water resistant, and just requires occasional oiling to maintain its finish.